Want to be notified of new releases in ChristianPalmiero/DHT11-Controller? The "sim" folder contains all the files intended for the simulation of the DHT11 Controller; the "syn" folder contains the synthesizable version of the same files plus the synthesis scripts. The "syn" folder contains also two sub-directories: "Standalone", with the results of the standalone version synthesis, and "AXI4Lite", with the results of the AXI4Lite version synthesis. We use the push button to start to read for the sensor. 1 switch to select the data to display : temperature or humidity (SW0). When the switch is set to 1, we read the humidity level, when it is 0, we read the temperature. 2 switches to select 4 bits out of the 16 bits (4-bit nibbles) of the data to display (SW1 and SW2). When SW1=0 and SW2=0, we display the 4 less significant bits of the data. When SW1=0 and SW2=1, we display the 5th to 8th less significant bits. When SW1=1 and SW2=0, we display the 5th to 8th most significant bits. When SW1=1 and SW2=1, we display the 4 most significant bits of the data. PE (Protocol error): if this LED in on this means that there was an error in the protocol, for example the MCU is waiting for a bit of data that is not coming or the DTH is not doing what is expected. SW0: display the value of SW0 (when this bit is set, it means that the switch 0 is set). B (busy bit): indicates that the delay after the power up is not passed or that the sensor is currently sending data. When the bit is set, we shouldn't try to read from the sensor. CE (Checksum error): if this bit is set, it means that the checksum sent and the one computed are different -> the data read from the sensor might be false. Remark: when the PE bit is set, we can use the other LED to display the kind of protocol error occurs but this may be not worthwhile and complicated. We use the 4 LEDs to display 4 bits of data (the 4 bits chosen by the switches SW1 and SW2 or the specific states specified above). The DHT11 controller and the DHT11 sensor communicates with a one-bit communication line with a pull-up resistor and a drive low protocol. datapath.vhd: it is a collection of functional units. dht11_ctrl.vhd: it comprises the CU and the datapath. dht11_sa.vhd: it comprises the ctrl, a debouncer, a checksum controller and two multiplexers that handle the data to be displayed on the LEDs though the switches. dht11_sa_top.vhd: it is the top level entity that models the 3-states buffer that uses data_drv to drive the data line between the DHT11 controller and the DHT11 sensor. SIPO: it describes a Serial In Parallel Out register, that stores input data in a serial fashion and makes it available at the output in a parallel form. 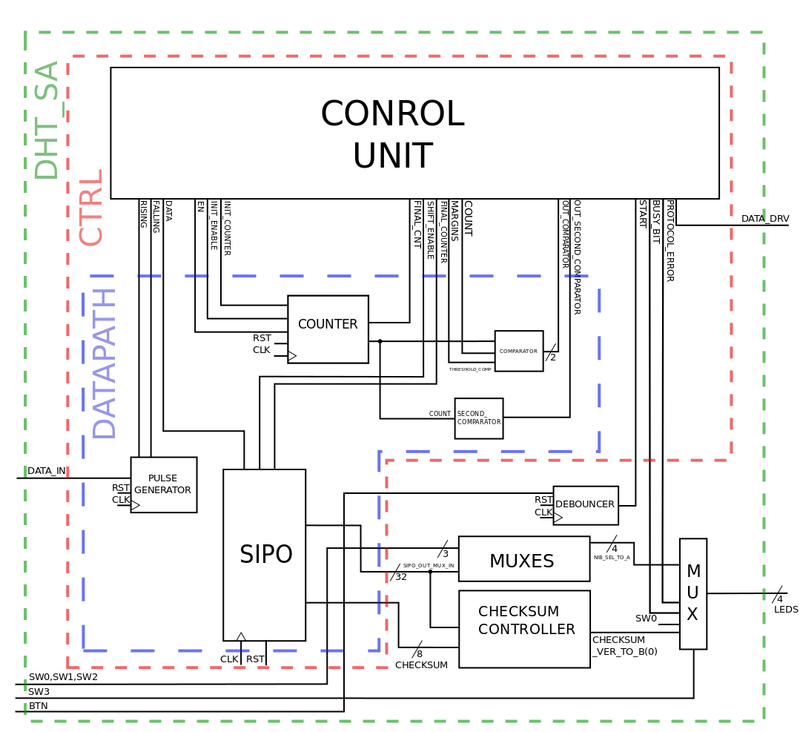 The SIPO takes as input the clock, a synchronous active high reset, an input serial data and a shift enable that enables the input serial data storage and the internal data shift. The SIPO outputs a 40-bit data signal and a final counter signal, that points out that all the 40 bits have been stored inside the register. MUXES: it describes a cascade of multiplexers that, according to the value of three input switches (SW0, SW1, SW2), outputs the corresponding 4-bit nibble of the temperature/humidity data coming from the SIPO that the user wants to display. CHECKSUM_CONTROLLER: it describes a combinational block that takes as input the the 40-bit data coming from the SIPO, computes the checksum and compares it with the one that has been computed and sent by the sensor. The checksum controller outputs the checksum error bit. MUX: it describes a multiplexer that, according to the value of SW3, either displays the 4-bit nibble output by the MUXES process (check state) or gathers together and shows some error information coming from the control unit (error state). The selected output is sent to the LEDs. COUNTER : it describes a programmable up counter that is initialised with a value generated by the control unit and that counts upwards, from 0 to the programmed value. The counter has the main purpose of establishing the correct data acquisition timing depicted on the DHT11 reference manual. The COUNTER outputs the current value and a final counter signal, that points out that the final programmed value has been reached. COMPARATOR: it describes a threshold comparator that checks whether the current counter value is in between two thresholds. The thresholds are computed by adding to and subtracting from a central value a delta (margin). The comparator main purpose is to help the control unit to detect whether a new phase of the MCU-sensor communication protocol has started not at an exact instant of time, but in between two thresholds. This behavior takes into account all the factors and the conditions affecting the accuracy of the sensor and allows the design to gain a little in term of flexibility. SECOND_COMPARATOR: it describes a threshold comparator that has exactly the same function of the previous COMPARATOR, with the only difference that it is used for the last part of the communication protocol (5.3 section on the DHT11 reference manual), that consist in receiving from the sensor either a "Data 0" or a "Data 1". PULSE_GEN: it is a multiple-stage pulse generator that detects a logic value change on the "data_in" line; it generates a 1-clock cycle pulse on the falling output if there is a falling-edge on the "data_in" line and a 1-clock cycle pulse on the rising output if there is a rising-edge on the "data_in" line. sim/dht_emul.vhd: a complete simulation environment for dht11_sa(rtl) where a full 40-bit data transmission between the sensor and the controller is executed. sim/dht11_ctrl_sim_old.vhd: a complete simulation environment for dht11_ctrl(rtl) with two generic parameters, the margin for protocol error detection and the clock frequency. sim/dht11_ctrl_sim.vhd: a less aggressive simulation environment for dht11_ctrl(rtl) with no generic parameters and a fixed clock frequency equal to 2 MHz. 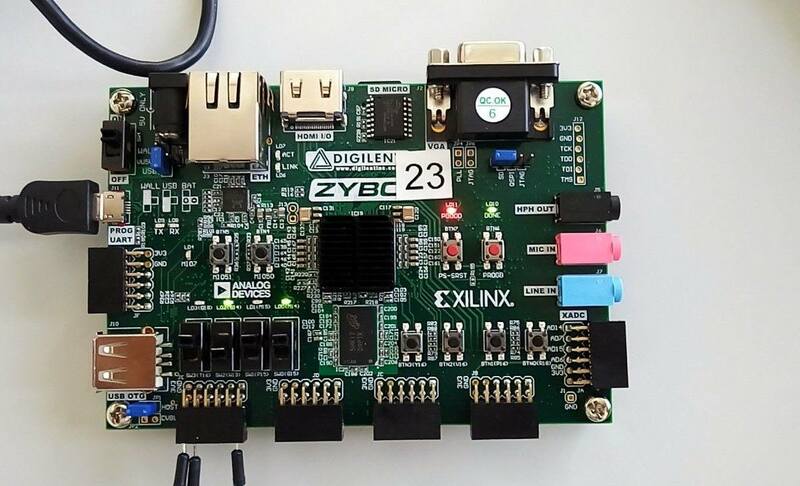 The design has been synthesised with the Vivado tool provided by Xilinx and mapped in the programmable logic part of the Zynq core of the Zybo. The dht11_sa_top.syn.tcl TCL script automates the synthesis. The primary clock "clk" comes from the 125 MHz Zynq reference clock. The synchronous active high reset "rst" comes from the press-button BTN1 of the Zybo board, the button "btn" is the press-button BTN0. The four "sw" input signals are mapped to the Zybo board four slide switches. The four "led" output signals are sent to the 4 LEDs of the Zybo board. Finally, the "data" inout line is mapped to the pin JE1 of the Pmod connector J. The synthesis result is a boot image: syn/Standalone/boot.bin. Two important reports have also been produced: the resources usage report (syn/Standalone/top_wrapper_utilization_placed.rpt); the timing report (syn/Standalone/top_wrapper_timing_summary_routed.rpt). An experiment in the EURECOM Campus Room 104 has been executed on July, 7th. The following pictures and data refer to temperature and humidity measurements. Writing to DATA or STATUS shall be answered with a SLVERR response. Reading or writing to the unmapped address space [0x00000008,...] shall be answered with a DECERR response. The reset value of DATA is 0xffffffff. DATA(31 downto 16) = last sensed humidity level, Most Significant Bit: DATA(31). DATA(15 downto 0) = last sensed temperature, MSB: DATA(15). The reset value of STATUS is 0x00000000. STATUS = (2 => PE, 1 => B, 0 => CE, others => '0'), where PE, B and CE are the protocol error, busy and checksum error flags, respectively. After the reset has been de-asserted, the wrapper waits for 1 second and sends the first start command to the controller. Then, it waits for one more second, samples DO(39 downto 8) (the sensed values) in DATA, samples the PE and CE flags in STATUS, and sends a new start command to the controller. And so on every second, until the reset is asserted. When the reset is de-asserted, every rising edge of the clock, the B output of the DHT11 controller is sampled in the B flag of STATUS. CU.vhd: it is the control unit, a complex finite state machine. dht11_axi.vhd: it is the AXI4 lite wrapper around the dht11_ctrl(rtl). dht11_axi_top.vhd: it is the top level entity that models the 3-states buffer that uses data_drv to drive the data line between the DHT11 controller and the DHT11 sensor. WRITE FSM: it handles the write operations. The slave asserts the AWREADY and the WREADY signals after the master has asserted both the AWVALID and the WREADY simultaneously; then, it responds with an error. Note that the write operations have lower priority with respect to the read operations. READ FSM: it handles the read operations. The slave pre-asserts the ARREADY signal so that each time the AXI master issues a read request, it will be acknowledged on the next rising edge of the clock; then, it responds properly. Note that the read operations have higher priority with respect to the write operations. COUNTER: it is a counter used to count up to 1 second. REGS: it is a process that sets the values of the two internal registers, DATA and STATUS. ADDRESS_SAMPLER: it is a process that samples the read address as soon as the ARREADY signal is asserted. MUX: it is a process that retrieves the proper DATA or STATUS content depending on the sampled read address. 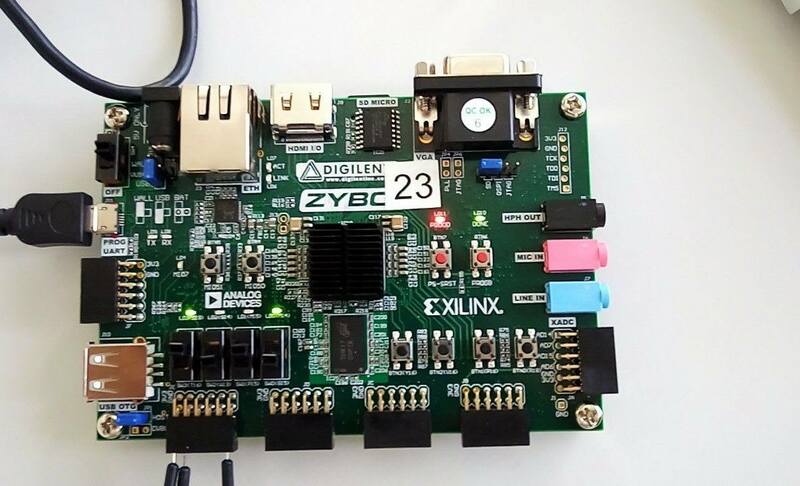 The design has been synthesised with the Vivado tool provided by Xilinx and mapped in the programmable logic part of the Zynq core of the Zybo. The dht11_axi_top.syn.tcl TCL script automates the synthesis. The synthesis result is a boot image: syn/AXI4Lite/axi_boot.bin. Two important reports have also been produced: the resources usage report (syn/AXI4Lite/axi_top_wrapper_utilization_placed.rpt); the timing report (syn/AXI4Lite/axi_top_wrapper_timing_summary_routed.rpt).